This weekend my esteemed Brother Duck came to visit. Many games were played and much fun was had. We hadn’t had a chance to hang out in person for a while and it was really nice to just chill and enjoy some gaming. 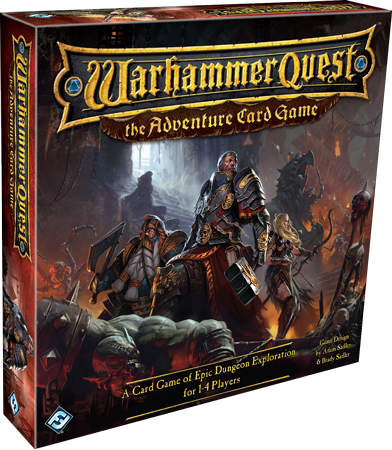 First my Duck Bro, his girlfriend, and I played the Warhammer Quest Card Game (by Fantasy Flight), which I’m generally very impressed with. It reminds me of Death Angel (also by FF) in that they’ve managed to capture the feel of a specific miniature game very well with just cards in different stacks. It’s quite similar to the LOTR co-op living card game (another FF product) but it’s easier to understand what’s happening and why. Overall definitely a co-op game I’d recommend. It’s got a fair bit of depth and replayability and it’s pretty cheap too at about £20-£25. Sadly the addon packs are extremely rare and expensive, but it’s a game I could imagine making my own addons for. Author BaconradarPosted on February 26, 2018 Categories Battle Report, Board Games, Fantasy, Heavy Gear, Miniatures, North, Product review, Sci-fi, SouthTags Bloodsuckers, Board Game, Fantasy, Heavy Gear Blitz, NuCoal, Pictures, Product review, Sci-fi, Southern, Warhammer Quest1 Comment on Duck Brother Day Skirmish!